Part of being a successful inside entrepreneur is working at your craft day in and day out — a big part of that is the fire hose of information and inspiration you direct your way. From Innovate Like Edison, by Michael J. Gelb we know that Thomas Edison’s voracious reading created a constant stream of insights, ideas and inspiration. Edison looked at books, plays, journals, magazines, scientific papers and newspapers in a never ending quest for greater depth and breadth of knowledge. 1. If you’re not part of Twitter, sign up and start learning. 2. Start chipping away at Steve Blank’s books for startups. 3. If you’re not part of LinkedIn, sign up, get your profile going and start paying attention. Join a few groups that interest you and start learning and contributing. 4. Instead of running out of Starbucks with your espresso, grab a paper and catch up on what’s going on. 5. Have an open mind in all of your conversations and experiences — you can learn from everyone (and it won’t take any extra time out of your day). 6. Attend local events in topic areas of interest and in topic areas you know little or nothing about. 7. Carve out some time over the weekend to get lost in a book store. 8. Read Success and Motivation by Mark Cuban. 9. Start learning from some of the best entrepreneurs in the world via Stanford’s Entrepreneurial Thought Leaders Series. 10. Take someone you want to learn from to lunch or coffee. 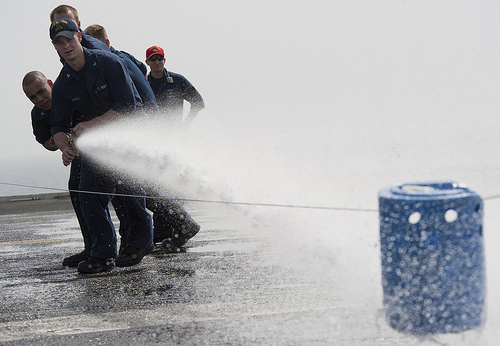 Drinking out of the fire hose is an important life-long skill — don’t wait to get started.